Confetti Letters: Festive Home Decor Featuring My New Flat! Festive Home Decor Featuring My New Flat! The main bulk of my decorations are found in the living room. 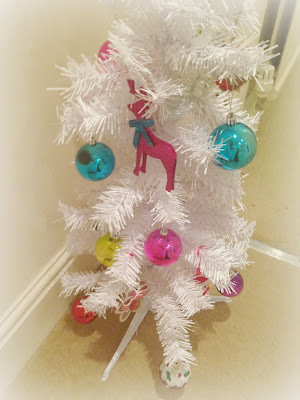 The tree was an absolute bargain from Tesco (£15 for 6ft!) as were most of the decorations including the silver baubles and the silver and blue baubles. The white glittery snowflakes and silver bead chain were from Asda and the glass heart and metal decorative rope were from The White Company. I have a fireplace! With a mantle! What luxury! The absolutely adorable felt gingerbread men and women on the wall were from Tesco, as were the little gold Christmas trees sitting either side of baby J. I also put out my Mickey Mouse candy cane stocking from the Disney store, and the little gold metal tree that I found in a cute shop in Exeter. The stained glass tree was made by my Mum and the wooden man holding a rabbit is a decoration that we bought when we lived in Moscow, Russia back in the late 90s. The little people on the right hand side were given to me by J's mum, and a snow globe from the 99p shop holds my childhood stocking on the fireplace. I am also absolutely in love with my little gingerbread house ornament, half price from M&S no less! The final decoration on the mantle is a beautiful little nativity set that I bought in Paperchase. It's been tradition to wrap garish tinsel around the bannister of the stairs in my house for years now (we're really not big tinsel fans at all!) and so I chose a bright and in your face multicoloured piece of tinsel from Paperchase. My Mum usually wraps lights in with hers too but I don't have a plug socket nearby :( This year though I went a bit different in place of lights and wrapped a jingly jangly wooden garland around the bannister full of reindeer, stars and bells. I love it, and another donation from J's mum. Continuing with the brightly coloured theme I have a 3ft white Christmas tree in the corner of the hallway that has lots of brightly coloured baubles and miscellaneous decorations on, like my gingerbread man and woman from Harrods, a glitter reindeer and some Christmas pudding baubles. I love the look of white trees with bright colours on, they look so fun and add something different to the traditional red and green decor you'd normally find at christmas! On the wall opposite the stairs I've hung a festive gold star. I really love this and it was only 99p from the 99p shop! Finally in the kitchen I've placed my a little silver Christmas tree on the windowsill that I bought from the 99p shop. I've been really impressed with their selection of decorations this year, and at such a cheap price you really can't go wrong, can you? And that's it so far. I didn't plan on going too overboard because we've just moved in (and won't even be at our own home for Christmas) but I can imagine that next year I'll decorate some more! How have you decorated your home for the festive season? Do you like what I've done? your flat looks super cute! Aw your flat is so festive :)! Thank you SO much for the feature!!! I am so thrilled with your home decorations.Thanks again for hosting too. Merry Christmas to you and your family!!!! Through The Gates Of Janus - Hello 2014. Festive 2013 - What I Got For Christmas.